I used Jen's Sketch For You To Try (3/21/09) for my layered birthday card. 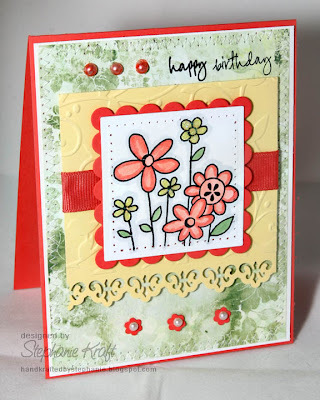 Since I popped 2 of my layers up on foam tape, I opted to omit the upper panel on her sketch and instead stamped Happy Birthday directly on my patterned paper. For my bottom embellishments, I punched tiny flowers from cardstock and added a pearl to each. The pearls to the left of my sentiment were colored with a Copic marker to match my flowers. Thanks for stopping by... Hope you have a great weekend! Accessories: Square Nestabilities (Spellbinders), Birds & Swirls embossing folder, Cuttlebug (Provo Craft); Markers (Copic), Fleur de lis border punch (EK Success), tiny flower punch (McGill), pearls (Kaiser), Star Dust stickles (Ranger), ribbon, paper piercer, foam tape, thread, sewing machine. Very cute. I like how you used the Porcelain paper. I love this! The colors are so pretty and so are the flowers! Handmade gift are my favorite!! I love this birthday card... It is looking so nice!! What a beautiful craft you have made.I love making handmade too.Whenever i give gift to my friends i always give my handmade stuff.Hope i will share my work to anyone.